Well… I love finding old things that are useful, and even better, if they feel like they have a story to tell. On the weekend, we went to 2 garage sales that were just great. At the first one, I found a shelf thingie that is perfect for holding my husband’s sheet music. He has been questing for this for ages, and I was convinced that one was out there for him. At the second garage sale, I was ecstatic to find the table top display manequin for jewelry and the wonderful ‘shabby chic’ vintage table that it is sitting on. And, it’s sturdy enough to support my swift, even when it is whirling madly. I have been hoping to find a jewelry display mannequin to help with photographs. It was serious happy dancing time when this one was sitting in the sunshine waiting for me to bargain a wee bit and then to whisk it off home and start dressing it up. The neck was hollow, which wasn’t good, as it showed off the frayed bits inside. It was a little too ‘Sweenie Todd’, so I cut some circles of grey foam and popped them in to fill that gap. Ms Mannequin wasn’t wearing the amber necklace when I bought her…. that’s one of my pieces that I made a couple of years ago. It’s crocheted copper wire with a huge hunk of ambler. I’ll be putting the necklace up on etsy and was in need of a way of photographing it, so the timing on this was just poifeck! So, that’s why I can’t resist the siren call of the garage sale…. treasures await! For weeks and weeks, I have been meaning to get my video tutorial of how to weave bias squares on the potholder loom posted to YouTube. What with one thing and another, I haven’t gotten around to it. One thing that was odd, was that I simply couldn’t upload videos for awhile. I just gave up on YouTube. Anyone else having trouble with uploads? Weird. I decided to re-shoot it, using ‘Tarn’, since I am working with Tarn so much, lately. 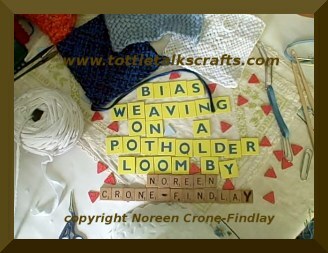 You can see some of the things I have designed for it here: Potholder loom. 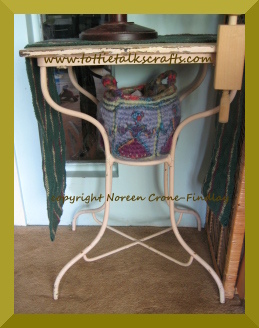 Over the years, when I was designing for the Potholder loom, I realized that I needed to be able to weave different shapes and in unusual ways with the looms. So, I have done a lot of experimenting with it. I have worked out a bunch of ways of weaving triangles on it, and this is how I twigged to how I could weave a square on the bias on the potholder loom…. after all, a square is just 2 triangles that happen to be in love. 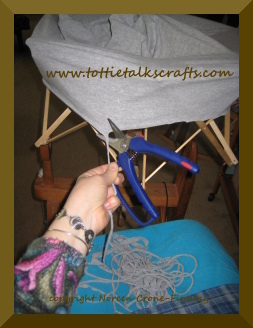 The pesky gaps on the potholder loom were a challenge – but I have solved the mystery of how to deal with them! How? Well.. check out the video! I’ve been working with Tarn (T shirt fabric strip yarn) a lot lately. 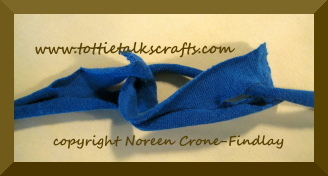 I remembered this afternoon that I had been asked how to make a smooth join in fabric strip yarn…. so I thought that I would post a quick tutorial on how to do that. Everyone has their own system of cutting t shirts into fabric strips (tarn). My favorite way is to stretch the t shirt over my swift and open it up until it stretches the t shirt taut. I then cut a narrow strip, starting at the hem of the t shirt, spiralling up to the sleeves. Then I stop and cut away the neckband, and cut strips around and around until I reach the sleeves. I cut them off, and cut them into strips. And then I wind them up into yarncakes on my nostepinnes. This pic has a touch of oddness, doesn’t it? The scissors floating in mid air are posing politely while my cutting hand is busily taking the picture. You can see the loops of Tarn pooling up in my lap. So, what do you do if you need to join one length of fabric strip to another? 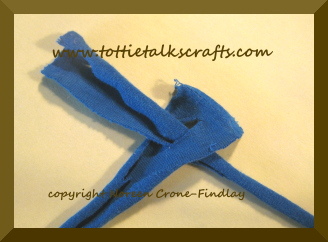 Cut a small slit into each end of the 2 fabric strips. Take the shorter piece through the slit of the longer piece. Now, take the tail end of the shorter piece through the opening of the shorter piece. Tug on it to pull it up tight, and Voila! the 2 strips of fabric are magically joined! A new design went live on the Lion Brand website today. It’s for a spool knitted Celtic Interlace medallion necklace. 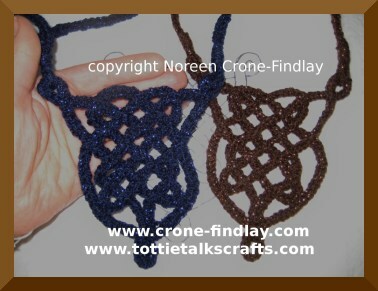 A very beautiful Celtic Interlace necklace, even if I say so myself…. ‘Why yes! I have seen it…. and yeppers… it IS one of mine!’ LOL! Spool knitting works beautifully for making jewelry, and I have designed lots of wearable pieces in spool knitting. It was a pleasure to design these necklaces for Lion Brand. I used their ‘Vanna’s Glamour’ yarn, which is very springy and stretchy, so it works well for making lightweight, very comfortable jewelry. The touch of glitter in them is great, and I like that it is really soft, and not scratchy, like some metallic yarns. 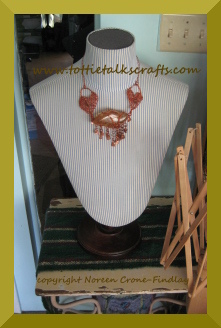 Because of the flexibility of spool knitting, you don’t need fittings or closures for the necklace. 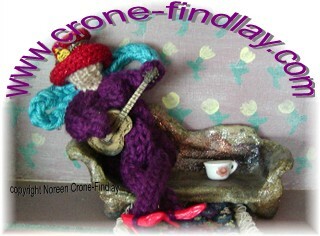 One lady wrote to me, after reading the article and asked exactly what spool knitting is, and how is it done.